Such exuberant outbursts would usually come from the designer’s fans. But it was McCartney herself who caused the commotion when global entertainment icon Oprah Winfrey appeared backstage at her show. Winfrey managed to utter “It was beautiful. It was fun,” amid the noise and cameras. Winfrey, who’s rarely seen on the fashion circuit, smiled as McCartney lavished praise. Winfrey arrived flanked by a bodyguard, race car driver Lewis Hamilton and Edward Enninful, British Vogue’s first black editor-in-chief. Strong shoulders with draping spilling down and pops of vivid color made up the style formula for McCartney’s show at Paris’ ornate Opera Garnier. The British-American designer said she aimed this season to project a “powerful persona.” Her chicly-deployed collection succeeded in towing the line between this strength and a softness that has come to be synonymous with McCartney’s designs. A vivid red gown with a cross-over-style torso and fluttery waist tassels perfected the Asian musing. In an intentionally divergent style, contrasting black thigh-high “stripper” boots accessorized that look to give it some welcome spice. A vacuum-packed oak tree leaf was included inside invitations to eco-warrior McCartney’s show. It was done to promote a campaign to protect the Leuser Ecosystem in Indonesia. Called “There She Grows”, the campaign invites the public and the designer’s friends — that have so far included Gwyneth Paltrow, Pink, Drew Barrymore, Jimmy Fallon and Rooney Mara — to dedicate a tree to raise awareness. The ecological references by the designer, who uses no fur and only “vegetarian leather”, continued in the collection through lashings of greens and browns in the color palette, and the use of upcycled material to make dresses. “We try to bring the environment into the conversation now, more and more,” McCartney told the AP. British designer Sarah Burton traveled back to where she grew up to inspire the fashion house’s wintery looks. “I took my team to those mills, to a landscape that I remember from my childhood. The heart of the collection is inspired by the bolts of cloth we saw woven both by man and machine,” Burton said. A shimmering silver floor-length gown, which was among the strong collection’s best looks, continued the industrial references. This look encompassing “high” and “low” — a twinning of factory machinery and luxury — is the type of fashion contradiction essential to understanding the spirit of Burton and the legacy of the late McQueen. Adding to the futuristic mood were powder-colored heels with shaggy fringing that evoked Chewbacca from “Star Wars.” There were also sheeny black high-waisted pants. 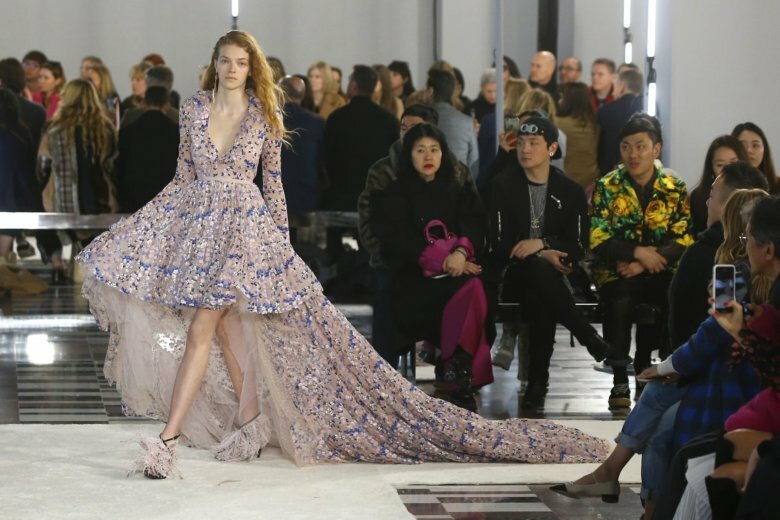 Valli’s signature floral prints and unfurling short silk gowns were ubiquitous and mixed in with the season’s top trends like emphasized shoulders. “I love to give emphasis in (a) big shoulder, but not in a powerful way. More like in a comfortable feminine way,” Valli explained to the AP. A darker and more aggressive mood than usual befell Sacai, one of Japan’s most popular luxury brands, and it was not just in the colors.